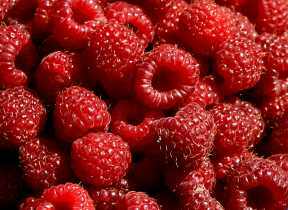 This is my favorite smoothie recipe - raspberries are my favorite fruit. I prefer to use fresh black raspberries, I gather them when they're ripe in my area and freeze what I can't use right away. Picking your own wild raspberries is a LOT of work, but the taste just can't be beat! I also use this recipe later in the summer when fresh peaches are ripe, you'd have to use the raspberries you've frozen, but yum! *Always try to use fresh fruit for smoothies - they have the most vitamins and there's no added sugar like most canned fruit!